Exactly what I was looking for. They are so cute! 6 Christmas Santa Claus Gift Card Holders. 4 1/2" or 11.5 cm Tall by 3" by 7 cm Wide. Handmade By Me. This will make a great gift this holiday season. Shipped very quickly; great quality. Thank you! Hair Stylist or Hair Dresser Earrings. Dangle Earrings. With Hand Decorated Box. Handmade by Me. Comb and Blow Dryer Charm. Real Birch Bark Heart Post or Stud Earrings. Lightweight. Approximately 3/4" or 20 mm tall. Nurse Earrings. Dangle Earrings. Nursing Cap Hand Decorated Box. STERLING SILVER Ear Wires. I "heart" Nursing. 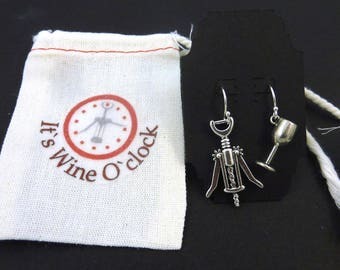 It's Wine O'clock dangle earrings. 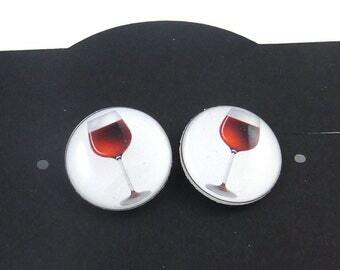 Wine Earrings. Post or Stud Earrings. Red Wine or Alcohol Themed Jewelry. SMALL and Lightweight 5/8" or 16 mm Round. ladybug earrings and matching gift box. 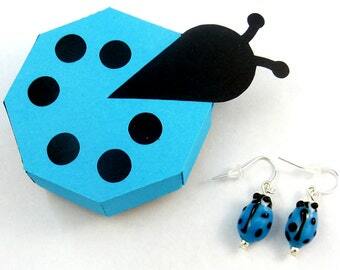 Handmade Ladybug Earrings and Handmade Ladybug Gift Box. Dangle Earrings. Light Blue Ladybug or Ladybird Glass Earrings. I love creating and have always been involved in various artistic endeavours. I found Etsy and the creativity has just exploded. All of the items you will find in my shop are handmade by me. I also have several other Etsy shops where I sell my handmade buttons (and one shop where I also sell my unique vintage and antique finds). I'm a self taught artist. I started making handmade buttons (and continue to do so in my other shops) but also found that if I use the buttons without holes they make adorable jewelry pieces. The idea behind outspoken jewelry is to provide jewelry that is out of the ordinary and has something to say. My jewelry is made with my own handmade buttons and components and vintage or found items. I try to make jewelry that you will not fine anywhere else. If you are not completely satisfied or just change your mind about something please let me know. I will gladly accept returns as long as the item is returned in the original condition and it is mailed back within one week of you receiving it. Your purchase price, including shipping will be refunded. I usually ship the day after payment is received. International buyers are responsible for all fees (custom fees, duty etc.) imposed by their country. If you have a custom request please contact me and I will see what I can do. If you ever have any questions about anything please do not hesitate to ask. I also have two other Etsy stores buttonsbyrobin and robin42.